I’m convinced that if I could see all of God’s plan, I just wouldn’t be able to handle it. So, it’s a beautiful thing how the Lord walks us through each day and each season, part by part, revealing Himself in new ways as we go along. I think one of the most beautiful gifts the Lord has given me to this point, is showing me my own brokenness – not in ways that I expected him to do it. You see, I didn’t know that the very areas of my life that seemed good, were the ones that had to be discarded. And in begging the Lord to fix the areas that seemed broken (on the outside), He began to show me just how backwards my thinking is… He wants the parts of me that I try to hold in my own hands – the parts of me that I believed I didn’t need his help with. When the outside is broken, the inside is emptied. And as we decrease, He increases in us. This morning I want to write the words of Jesus in the book of Mathew (9:15) – when Jesus was asked why His disciples didn’t fast like the pharisees fasted, And Jesus said unto them, “Can the friends of the bridegroom mourn, as long as the bridegroom is with them? but the days will come, when the bridegroom shall be taken from them, and then shall they fast.” I really only have one true experience with what I would consider a LONG fast and it wasn’t planned. I didn’t even think about it and as I look back I’m not even certain how long this fast lasted. I would guess it was somewhere around 10 days that I didn’t eat. I also wasn’t sleeping and I wasn’t drinking initially. Although after several days I began drinking very large amounts of water – almost as if to flush out my system completely, even though none of this was planned – it was just what my body craved… It was like a detox orchestrated not by me. This fast occurred through a time of very intense tragedy. Many of us have had one of those seasons, when the world is so far upside down we can’t eat or sleep – barely surviving off of adrenaline. And we fast without any intention or forced ideas. But during this horrible time in my life, on these days when I fasted because I had not strength in me to do anything other than fall apart… that’s when I heard the Lord’s voice for the first time… and with a tear-stricken face, swollen eyes and a body that was so weak I coudln’t even peel myself off of the floor of that hospital room.. His embrace was so beautiful. Jesus said when HE left, then His friends will fast. Then he went onto talk about something I’ve always found difficult to understand in carnal thoughts – the old garment and the old wineskin. Jesus made it clear many times that HE planned to come “into us” – inside… In John 14:20, He said, “At that day ye shall know that I am in my Father, and ye in me, and I in you.“… and in a discussion with the Pharisees as they inquired about WHERE the Kingdom of God is, Jesus said, “it’s not here!” He said we can’t see it with our eyes, it’s not a place! Luke 17:20 – “The kingdom of God cometh not with observation: Neither shall they say, Lo here! or, lo there! for, behold, the kingdom of God is within you.” He also said that it was in favor of the disciples that He should leave because then the Holy Spirit would come INTO them. So, back to Mathew 9, Jesus said we don’t put a new patch on an old garment. The old garment has to be done away with completely to receive a new one. 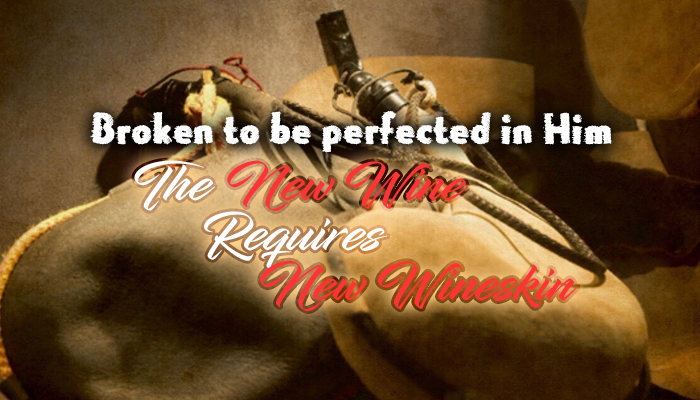 And then He adds to this saying that you don’t put new wine in an old wineskin. We are a vessel (an unclean vessel), and what Jesus offers – is to pour out Himself into us, but He makes it so clear here that He can’t come in with the new, without ridding of the old. We have to be cleaned out and emptied and there’s no way to get inside without breaking the outside. One of my friends talked about revelation she received from the Lord recently about “the body”.. Jesus told the disciples that the bread represents his body and the breaking of the bread was necessary before the bread could be dipped in His blood (the wine), and they could drink of Him. 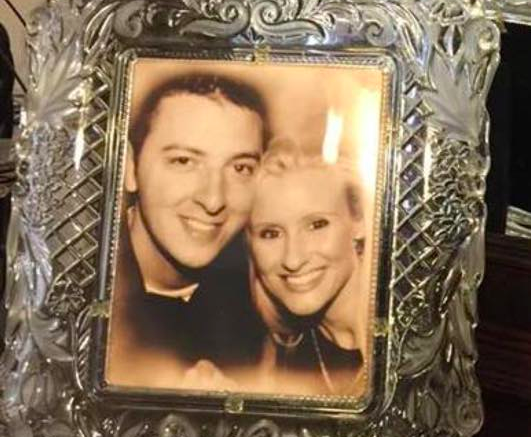 What the Lord showed her was that HIS BODY that’s broken, IS US!…. In 1 Corinthians 12:27 Paul says, “Now YOU are the body of Christ.” The bread (His Body) was broken before they could eat of Him. And then after that, they were to drink the new wine (His blood of the new covenant). It’s hard to grasp that God would ordain for his children to be broken, just as it was hard for Peter to step out of the way as God’s will for His only begotten Son was to be crucified on the cross for our sake. This isn’t a concept our human minds accept easily. But as the Lord leads us through these trials we face, so often we stand on the other side of a great storm and realize that the circumstances that BROKE us, while they were difficult and awful, yet the outcome of what has changed inside of us is so beautiful. Be encouraged that the Lord is on the throne and in control of everything that we go through. Changing our circumstances is so easy for Him. Look no further than all of the miracles in the Bible that God did to glorify His Son.. But let us remember also the manner in which “It is finished.” Jesus holds the keys to death my friends and he doesn’t want any of us to be lost eternally. We are to be equally yoked with Him eternally, and eternal is the point. Jesus said, “Don’t take thought of your life and what you will wear or eat or drink.” And James said our life here is so temporary, it’s like a vapor or a mist. Sometimes the very things that seem so horrible in our temporary journeys here, are the very things that are needed to break the old wineskin, because God is going to pour the everlasting wine inside of us…. Jesus himself living in us.. He fills us with HIMSELF (The LIFE), and His Kingdom is being set-up within us. Let us hold onto HIM with all we have and trust that He will finish the process he has started in us. Father, today I just thank you for Jesus. I ask for your guidance and your will to be known to your children, Lord that we may be of one accord with you. Help us to not rebuke the circumstances that you have ordained in our lives but instead to have eyes to see your eternal plan and ears to hear your voice, that we may be given wisdom from you and strength of our Lord Jesus to endure as he endured. You know Lord that we can’t pass the test without you so please pour out yourself into us today, give us YOU, our daily bread as YOU are the hidden manna that we so desperately need. Help us to rejoice even in our trials as you send your Holy Spirit to comfort us and fixate our eyes not on our circumstances but on the hope of Glory, which is YOU Jesus.. and always has been and always will be. You are our portion Lord and I thank you for loving a wretched woman like me.